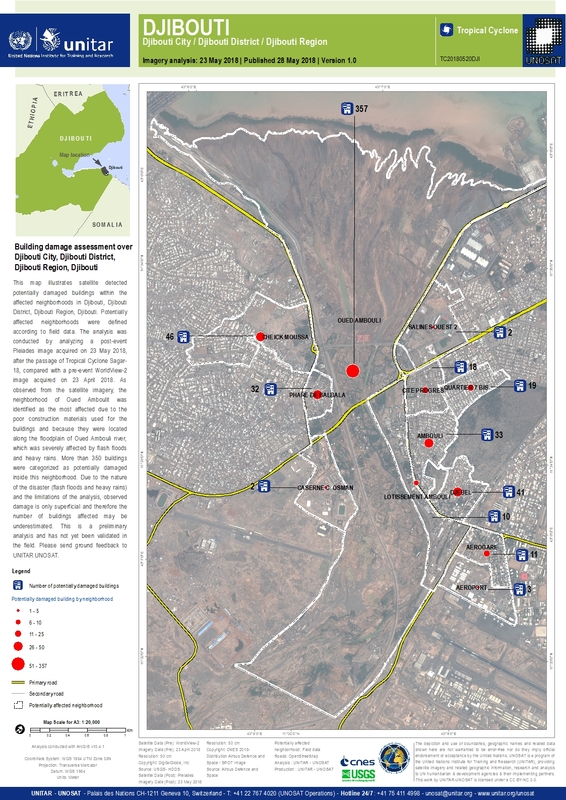 This map illustrates satellite detected potentially damaged buildings within the affected neighborhoods in Djibouti, Djibouti District, Djibouti Region, Djibouti. Potentially affected neighborhoods were defined according to field data. The analysis was conducted by analyzing a post-event Pleiades image acquired on 23 May 2018, after the passage of Tropical Cyclone Sagar-18, compared with a pre-event WorldView-2 image acquired on 23 April 2018. As observed from the satellite imagery, the neighborhood of Oued Ambouli was identified as the most affected due to the poor construction materials used for the buildings and because they were located along the floodplain of Oued Ambouli river, which was severely affected by flash floods and heavy rains. More than 350 buildings were categorized as potentially damaged inside this neighborhood. Due to the nature of the disaster (flash floods and heavy rains) and the limitations of the analysis, observed damage is only superficial and therefore the number of buildings affected may be underestimated. This is a preliminary analysis and has not yet been validated in the field. Please send ground feedback to UNITAR UNOSAT.